So, is that enough color? LOL, so what do you think now? Definitely more colorful! Almost blinding even! I like it, it looks happy. :D I'm sure I'll still fiddle with it. Any suggestions? Let me know what you like or don't, or if you think the whole thing is hideous lol. I'm working on finding a different background since I don't like the plain turquoise. Anyone who has read my blog for even a short amount of time should realize I absolutely hate housework. Even simples tasks like making the bed. Seriously, isn't my time better spent blogging playing with my kids? But, alas, I can't put off housework forever, it has to be done whether I like it or not. So I try to come up with shortcuts, or tricks to make myself think it's easier. One of these tips is with dishes. Have you ever timed yourself loading or unloading the dishwasher? It really only takes a few minutes I've found. Loading takes maybe 5-10 minutes (depending on how caked-on I've allowed food to get on everything) and unloading takes less than 5 minutes. So in total unloading and loading together should only take 10-15 minutes (well, unless you are my hubby, who has to scrub clean each dish first. What's the point of even putting them in the dishwasher if you already clean them?!). Anyway, so what I do when I need to load/unload is wait until I'm already cooking something in the kitchen. Then during the time I'm waiting for the water to boil, microwave to finish, or pudding to chill in the fridge, I use that few minutes to do some dishes. Just this morning as I was microwaving my instant oatmeal I unloaded the dishwasher. It took about 3 minutes, which was perfect as the oatmeal cooked 1.5 minutes then I got to let it sit and cool down another 1.5 minutes. This is great because then you aren't just wasting those few minutes waiting, and you don't have to disturb your blogging other important activities later to do dishes. This works for me! 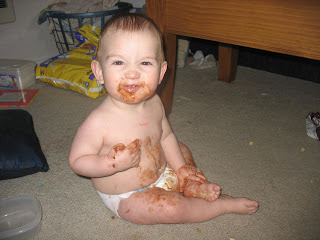 I was just writing another entry on my wife's blog just to see if I can drive her nuts. Just kidding. I was actually writing to give an update on my thumb. It is actually healing really well. Kara has actually posted an updated picture in the same link as the hospital pictures. It is under the post entitled 'Warning-Graphic'. And with the pain killers in action, life is peachy. I am able to bend my thumb and I am getting used to the fact that it is a bit shorter than normal. All in all, though, it is healing great and in the end, hopefully, it will seem like nothing happened (besides the shorter part. Thanks again for all your get wells. Until next time, take care. What do you think? Is there anything you think should be changed, colors, layout, etc? Any feedback is helpful! I will probably play around with it a bit over the next few days, maybe find a different background. * Clean out fridge, it's way past time, I'm scared of what I'm going to find! I really hate cleaning out the fridge, it's so gross! And it's been a few months since I've done it so it's going to be really bad! But at least now I'll have my tupperware free again lol. And hopefully the kids will let me have a nap today, I'm so tired. Well, this is my 300th post on here! Woohoo! 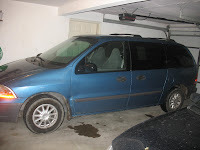 Today we have to go get some light on the van fixed and finish signing papers. We will probably be at the in-laws most of the day. Hopefully I can catch a nap while there, Baby has been sleeping so horribly this past week so I am exhausted. I need to go get the boys dressed and ready to go now. I had a hard time paying attention in church today. Toddler was being a bit noisy and talking the whole time. I forced him to eat gave him some cereal to keep him quiet. Sadly I can't remember what any of the talks were on. I will have to try harder next week to actually listen. "True friendship multiplies the good in life and divides its evils. Strive to have friends, for life without friends is like life on a desert island...to find one real friend in a lifetime is good fortune; to keep him is a blessing." Good news for all of you joining in SHS- for every person who joins in at least 2 weeks in a row by the end of March, you will be entered into a drawing by Lara for 5 of her organizing bags! What a fun idea! So if you have a wanted to join in, but haven't gotten around to it yet, do it now! As you can see, I did ok on brushing teeth and dishes, though not as good as I'd like, but I didn't read my scriptures at all and only cleaned a few days. I'm going to work on these more this week. #1- Clean 1 hour a day (except Sundays). Started out good, but the last few weeks has slacked. I'm revising this to 1/2 hour a day, if I do more than yay for me! I think this will help me make it a habit faster. #2- Dishes. Stay caught up by unloading/loading right away. Also started out great, but not quite as good now, though not horrible. I'm keeping this as is, cuz I really want to make it a habit. #3- Brush teeth 2x a day. Haven't done too well. Going from 2x a week to 2x a day is a big leap. So this I'm revising to 1x a day, and hopefully that will become a habit soon and I'll go back to 2x a day. #4- Read Scriptures every day. Well, as you can see, this didn't get done even once, oops! No revising here, I still want that to be my goal, hopefully this week will go better! OK, and my new goal for this week will be to work on a bedtime routine for Toddler. This will be bath-time (every other day), brush teeth, read a book, say prayers, and bed. Ever since I started working his bedtime has gotten crazy. Since he doesn't go to bed until I get home, and my schedule varies, he has no set bedtime. Hopefully this will make it easier despite no set time. Good luck to all of you with your goals! Check out SHS at The Lazy Organizer to learn more about it and join in! I have a c-section scar from having Toddler. I also have a big scar on my rear end from being burnt by a wall heater as a baby. And a few other little ones. Soup:What is something that has happened to you that you would consider a miracle? Being so blessed with my wonderful hubby, 2 great kids, and pretty good average life. Salad:Name a television personality who really gets on your nerves. Main Course:What was a funny word you said as a child (such as "pasketti" for "spaghetti")? Dessert:Fill in the blank: I have always thought ______ was ______. I have always thought Harrison Ford was hot. 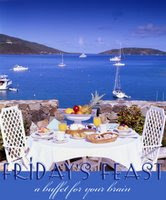 Check out the Friday's Feast home to join in! Cereal is so yummy! I like lots of kinds, but stuff like rice krispies, cheerios, kix, etc that are plain I love to put sugar on, and those are my most favorites usually. OK, some of you said you want to see pics of Hubby's thumb, I warn you it is disgusting, I can barely look at it. I don't have a good pic of what it looks like all sewed back together now since it's been bandaged up, maybe once it's all healed I will. Hello from Kara's Husband. Thank you for all you get wells lately. I have the greatest wife in the world. It's great to know people are there for you when things turn ugly. OK, Mimo, why does your blog link take me to something about "chia garden herb pet" search results and pills for manly, uh, problems?! I'm so confused! Help, I can't get motivated! Well, let's see what I've gotten done so far...nothing! Well, I did get a nap, but then Hubby called and woke us up :P I'm about to get the boys ready to go to the bank and library. I'm so tired. I've been staying up until midnight the last few days to make sure Hubby gets his medicine, plus getting up at 4am to give it to him again, plus getting up with Baby a lot. I hope the boys will let me take a nap, I need it! Well, after our crazy weekend, it's nice to have a normal day. Hubby is at work, luckily you only need one thumb while typing lol. The kids are watching cartoons. I need to clean up toys, again. And I need to work on getting the blood stains out of hubby's pants. I work at 5 today. I also need to go to the library and the store sometime today. Last night DH was trying to fix our garage door. The chain had come off the gear so he was trying to put it back on. Well, somehow it started moving at the wrong time, his thumb got caught between the chain and the gear and it ripped a chunk of his thumb off. I was upstairs about to get the boys in a bath when I heard him yelling something. I turned off the water and yelled "What?" and he goes "Get down here! We need to go to the hospital now!" I ran down and saw him standing at the sink running water over his hand and there was blood all over. 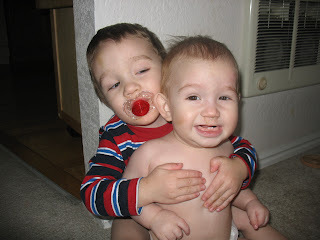 I grabbed a dishtowel and had him put it around his thumb, then started wondering what to do with the boys, they were in diapers and the carseats weren't in the car. So I ran to the neighbors and had her come stay with them and off we rushed to the hospital (and yes, I found the missing piece, it was so gross, but they couldn't put it back on, it was too ripped up and covered in grease and dust). They got us right back into a room, stuck him with some numbing stuff, that didn't take very well, and got xrays and called in the orthopedic specialist. He also had me call his mom (I think everyone wants their mommy when they hurt, no matter their age lol) and she drove down from 1hr away and got there before the specialist who lives in town lol. Anyway, he finally got there after we'd been there 2hr45min and in about 30 mins had it stitched up and wrapped. He's missing the top from about 1/2 the fingernail up, plus some further down on the inside since it cut at an angle. But luckily once it heals he should be able to use it pretty normally, it'll just be shorter and look kinda weird. Anyway, it was a very long scary night, I've never seen DH in so much pain. And I don't know how we will afford the bills from this, but it could have been so much worse. DH is now drugged up and I'm letting him just sleep today, poor guy. This quote is me lol, and probably many other people. We all want more money but don't really want to do what it takes to have money- work harder, save, budget, etc. We live in a society of instant gratification. We want everything and we want it now, and if we can't afford it we go into debt to get it. Hopefully one day I'll overcome this foolishness, we really are trying. Unfortunately I've been sick for a week and it's been hard for me to do anything. I did ok, but I could definitely do better. I only brushed my teeth on 3 days and only cleaned an hour on 3 days, and off and on keeping up with the dishes. I would post a pic of my Joe's Goals page, but it's embarrassingly empty lol. I will do better this next week, hopefully I'll be feeling better too. My new goal is going to be to read my scriptures every night. I've gotten out of the habit and haven't read them in a long time. So one chapter a night will be my goal. If you haven't joined SHS yet you can still do it! Check out The Lazy Organizer. I love being a mom, I feel it's what I was born to do. That doesn't mean I always do a good job though, like every parent I make my share of mistakes. Luckily kids are very forgiving and I haven't screwed them up too bad so far :) Plus the rewards far outweigh any costs. * "I wub you Mommy"
What other rewards do you just love about being a parent? Or at least that's what my mom used to always tell me. I have a serious sweet tooth. In just 2 days I finished off a pound of Swedish Fish, and I'm sitting here munching on gummy worms and peanut butter cups. Not to mention all those Hershey's bars hubby bought me. If it's not around it's not a problem, but with this much candy laying around I can't control it! Help!!! OK, seriously, I really don't have a favorite number lol, I'm just too sick and drugged up to think of anything neat to write about! Still sick, but the medicine is helping a ton. I have to work tonight from 5 to close, I hate closing :P Hopefully I can get through it ok. At least business has been kind of slow so it shouldn't be too hard. Here's what hubby got me for Valentine's Day. 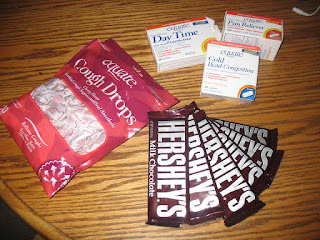 Not only did he get every type of medicine I might need, he also got me chocolate. He definitely knows the way to my heart! I was tagged by CrAzY Working Mom for this MEME. Basically I tell you 5 things I might not have mentioned yet on here. 1) I'm underweight. I have no idea how this is possible after having 2 kids, eating all the time, and being a sugar-holic, but it's true. My family and in-laws are always telling me I'm too skinny and need to eat more. I really do try! 2) I don't like Steak and Shrimp. Everyone says I'm weird because of it, but I just can't stand either. 3) I like Veggietales. You know "Sunday morning values, Saturday morning fun!" I think it's a cute carton, and I prefer my Toddler to watch that over most other cartoons these days. 4) When I was around 15 I broke my pinky playing church basketball. Amazingly, the only 2 shots I made the whole season were during that game after it happened. I am no good at sports but somehow I could manage sinking 2 shots with a broken pinky?! Luck I guess. 5) Most people think I'm younger than I am. I'm 23. At work most people guess I'm 17, they don't believe me when I say I'm 23, married, with 2 kids. My braces probably have something to do with it. OK, I tag...Beth, Dawn, and Rachel. I'm not tagging Michelle this time cuz I always do and I figure it'll get to her from one of those people anyway lol! "Honey, they're playing our song!" I cancelled my orthodontist appointment today; Hubby was getting the car fixed. We need new tires and the suspension needs fixed too, more $$ we don't have :P His interview went well, then we went to Wendy's for lunch, and I called in sick to work. Hubby is now out getting me some medicine and cough drops. Hope everyone has a great Valentine's Day! We aren't doing anything special. I have an orthodontist appointment, Hubby had an interview, and I work at 5. Fun fun. Plus I'm still sick, feeling worse than ever. But hubby was sweet and took the baby for the night so I could try to get some sleep alone. First- My friend Carrot was challenged to get comments from readers in all 50 states in 15 days, for this her hubby will give her $50 and a weekend by herself. So go check her out and see who else she needs (other countries are also welcome). Plus she is hilarious! Antique Mommy- "Good luck with your surgery! I hope all goes well." Chilihead- "Those spin art things are so cool!" Shannon- "Yay for you, that is so cool!" Tammy- where'd your blog go?! No rest for the weary right? Not really much to do today. Why does typepad hate me?! I still am having trouble posting comments on typepad accounts. So everyone out there that I normally visit who has a typepad account- I'm not ignoring you! I want to comment but it won't let me! Ugh, I really hate being sick. It started Thursday with a scratchy throat, Friday a dry cough joined in, and by yesterday I was miserable. :( On top of it Baby is sick too. So us sickies are staying home from church today. Hubby took Toddler by himself. I'm gonna go lay on the couch and read while Baby watches Veggietales. Maybe I'll have some hot chocolate. #1- Clean 1hr a day, does not need to be all at once. #2- Dishes, unload as soon as dishwasher is done, load dirty dishes immediately after use so it can be run again once full. #3- Brush teeth 2x a day. 1) The heat. It was so lovely to get away from Winter and be warm! I can't stand cold. 2) I didn't have to worry about cooking, if I was hungry I just went to one of the restaurants and ate as much as I wanted. 3) The free drinks anytime. We could lounge in the Lobby Bar (we don't drink alcohol but they had plenty non-alcoholic drinks) or by the pool and they bring drinks or snack to you. 4) Chichen Itza. The Mayan ruins, I've always wanted to sees stuff like that, it was so cool. Plus the stop to swim at Ik-Kil on the way there, also very cool. 5) Time alone with hubby. It was like a 2nd honeymoon! Didn't have to worry about the kids (ok, I still did, I'm a mom, of course I worry! lol) and we had plenty of time to just be together and do whatever we wanted. OK, clocks might be a weird one lol, but we really like clocks here, we have them everywhere! On our vacation the only clocks were in our hotel room so we never knew what time it was and it drove us crazy! I really can't stand not being able to know the time. I'm not being very productive today, just being lazy. Making sure the kids are taken care of, of course, but haven't done any cleaning that really needs to be done. I just don't feel like it, I'd much rather nap and eat :D I can't even think of a "Works-for-me Wednesday" post. Blah. The boys are being cute today, and playing together. The pic is from today, they both love getting their pic taken. Aren't they just too cute (though somewhat messy lol)?! My house is still a disaster, but I just don't the energy to get it all clean right now, still recovering from vacation and getting used to Baby waking me up all night again. I'm hoping the boys will nap good today so I can get a shower. 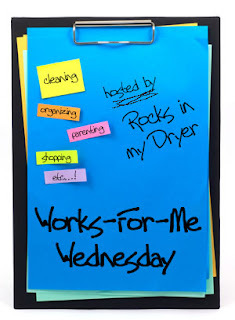 Today I am spotlighting one of my best friend's and her great blog! Michelle is funny and sweet and always comments and gives support when needed. Her posts are very funny, she is a great writer, and she's witty and captivating. I actually met her online on a messageboard 3 years ago when we were both pregnant with our toddlers, and now she lives just a few miles away and has become a great friend. Go check her blog out now and enjoy! Well, I'm trying to get back into normal routine. I'm way behind in everything online, so I'm not going to even try catching up. We have been home less than 24hrs and the house already looks like a bomb went off in here. I have errands to run today. Need to go pick up my last check and see what I work this week, go to the bank and put the money in since we are 42 cents under, go to the library to pick up books on hold, I think that's it. Also need to do dishes, clean up the living room, vacuum, do more laundry, and clean the boys room. My SHS goals went out the window with our vacation, so I need to start getting back into my habits. But what I really want is a nap, for some reason when the baby decides to sleep ok, I don't. Maybe if I'm lucky both boys will nap at the same time today. Well, I'm back! The trip was wonderful! I'll have to post pics later when I get them downloaded. The first day there kinda stunk, cuz we had a long trip over, and both pumps I brought with me wouldn't work, so I bought a pump n the way to the airport Mon morning and it was missing a piece and wouldn't work either! By the time we got to Cancun I was in so much pain since I hadn't nursed or pumped in over 24 hrs. We finally found a little pharmacy that had those old fashioned little bulb-suction hand pumps, but it worked great. They also screwed up all the rooms when we checked in. Everyone that was supposed to have 2 double beds got a king size and vice versa. So we switched Hubby's friends for his king size and the room was beautiful. Looked right out over the ocean with a hammock on the balcony to relax in. Picture perfect seriously. Tuesday we just laid around and did nothing, sunbathing, eating, etc. Was so nice to just relax. Wednesday we went to Chichen Itza, the Mayan ruins. That was so cool! It was 3hrs away but our tour guide was cool and we stopped at Ik-Kil where they have a huge underground cavern freshwater pool, it was so beautiful. So we swam in that for a bit. The ruins were so cool. People aren't allowed to go up the big pyramid anymore though cuz they've had too many accidents, but there was so much to see. We bought a few things, bartered really good. Got a stone chess set for $10 when the lady asked for $20, and a hammock for about $11.50 instead of $25. We got some maracas for the boys. Then Thursday we were lazy again, played in the ocean, swam in the pool, sunbathed, etc. Friday we walked down to an outdoor mall and bought some t-shirts, then just lounged around and got packed. Then yesterday we had to get up at 3 to get ready to go, the bus took us to the airport at 4, plane left around 7 to Denver, we had a 5 hr layover in Denver then flew on to SLC. We were going to come home last night but by the time we got to my family's house we were just too tired, so we spent the night. I missed my boys so much! My milk is practically gone though, that little pump wasn't enough to keep my supply up, so I need to get back to nursing a ton, Baby will have to be supplemented with formula for a while and hopefully my supply will come back soon. But the trip was so great. Oh, I also got an ear infection Wednesday, so I can only half hear in my right ear right now, and it's making me dizzy to sit here too long. The house is freezing since we didn't have the heaters on high while we were gone, so the office is so cold and my fingers are getting stiff lol. Oh yeah, my friend called me last Sat when we were still in SLC to let us know our pipes had froze! (She was checking on the cats for us) Luckily she stayed there and had the city come unfreeze it, and then left some water running the rest of the time. Anyway, now I've got my little boys so I'm going to go cuddle them, Toddler didn't seem very happy to see me though :( Grandma's house is just too fun.